I got a recommendation from someone I trust to check out the book Flat Earth News. I've worked in media for my entire career and specifically did a lot of news production in college, so they knew I would be interested. I always love to discuss the modern media. Flat Earth News is about how the traditional press is set up in a way that institutionally make it hard to do a good job at the news. I only read the first third of the book before I had to put it down. It already feels dated in our modern internet era. It had an interesting snapshot of the newpaper business from ten years ago, but it's not as relevant today. A different source recommended Trust Me I'm Lying. I'm not even done with it yet, but this book is amazing. It covers the way our modern media works in an internet age. It's such a good book. The author shows ways that he has purposefully and easily manipulated the media in the ways he wanted to do. It's basically a step-by-step guide to PR and media manipulation. It's just amazing. 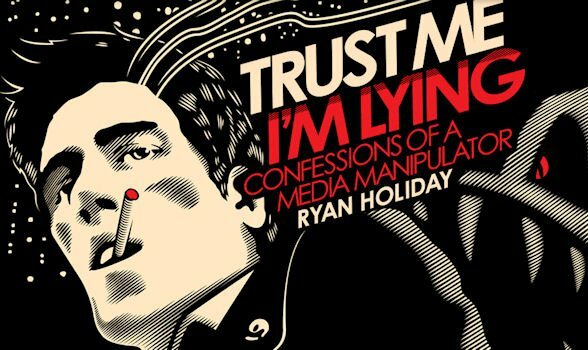 I feel like Trust Me I'm Lying should be required reading in modern journalism schools. If you have any interest in the modern media at all you should pick it up and give it a shot.